This movie is my comfort movie. When I'm sad it makes me smile no matter how many times I watch it. It's the movie that made me adore Heath Ledger. I love the humor and the literature references. Band/ Artist: Tom Leher "The Masochism Tango"
Awe a man before his time. I incorporate Tom's music into my funny songs category. the songs I really enjoy listening to that put me in a better mood. I love his version of the tango- it's amusing. I was never an angel fan, but I am a Bones fan. I love their back and forth, the strength in the relationships and the fact that Brennan is so...over the top. This is an old book originally published in 1796. 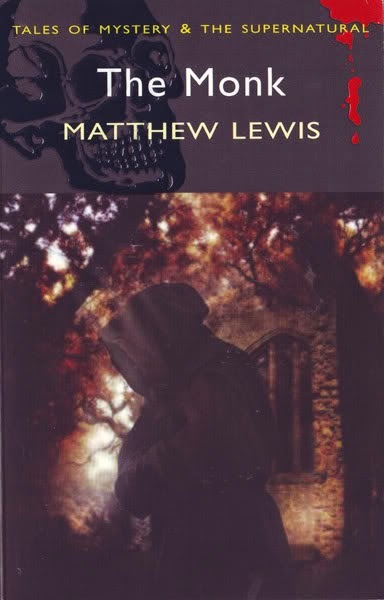 Lewis was 19 years old and wrote the 442 page novel in ten weeks. That's right I said 10. in 1798 a lawsuit forced him to republished a 'censored' version. This is a gothic novel. I read it for a literature class I had in college and fell in love with the style. I was in awe of Lewis's ability. It's his only publication novel wise- he did write plays- but imagine what he could have done if he'd written more novels. His potential was endless. The structure of the book is unique for it's time and what many books and movies are based on. This is not a light read nor is it a quick read. It's an old read, with mistakes, and flaws, and so much passion and inspiration. A Knight's Tale was just fun. The insertion of rock music just added to the campy fun. I love A Knights Tale. It's a fun movie, for sure. I was into Bones until she showed up preggers. GAAAH! She's gonna have a baby and I haven't even seen them kiss?!!! They left out all the good stuff, LOL. A Knight's Tale...yes. LOVE that movie. Just an awesome good time. And I've heard of The Monk. I remember reading about the big controversy over it. Makes me want to read it! 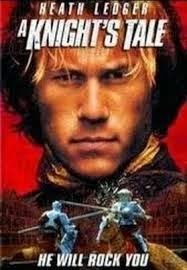 A Knight's Tale is awesome! And I love the Masochism Tango. "You have been found lacking!" I love that movie. I love A Knight's Tale and how they used modern rock. It always makes me a little sad about Heath Ledger. I'm checking out that book. Knight's tale was a movie I could have seen more sequels as they crossed modern with medieval.. and I believe was the first to do so... love the music and the score to it. I'm not sure I thought of Bones or A Knight's Tale as underrated, but who cares! Awesome, awesome choices! I have never seen A Knight's Tale. Thanks for the recommendation! I may have The Monk buried somewhere in my several boxes of books in a storage unit. I'll have to go hunting for it. The movie and tv show you listed are both among my all time favs. Sweet. Is that, by chance, the book? I searched the title and author, and Amazon dropped several answers on me.